I am a big fan of Marc Fosh – the amiable Londoner who became the first British chef in Spain to have his cuisine recognized with a Michelin star. He was working at Reads Hotel on Mallorca at the time, and we went there quite a few times (for birthdays and anniversaries) while he was at the helm in the kitchen. He left Reads, and the star, to open his own restaurant, Simply Fosh, in Palma. Food and photos to swoon over. I was thrilled to hear recently that Marc had published a collection of more than 50 of his recipes for home cooking in the first edition of Fosh Food Magazine. Yes, of course I have a copy. And I have tried several of the recipes, successfully, when we’ve been entertaining at home. As well as the recipes themselves, there is helpful information about individual ingredients, such as asparagus, strawberries, garlic etc. The cheffy tips and tricks, including the art of making vinaigrette and a perfect crème anglaise (custard to you and me) are all appreciated. There’s also a list of measures and conversions at the back. Marc also persuaded Rafa Martin – one of Spain’s leading bartenders, who owns Brass Club Bar in Palma – to provide some summer cocktail recipes. Summer may soon be slipping away, but I bet they’ll taste just as good in the autumn! Chilled cucumber and coriander soup with a ceviche of tuna and prawns. Cheat’s banana, honey, passion fruit and ginger ice cream. Vanilla yoghurt parfait with spiced cherries. They were all easy enough to make, and delicious, and I will be trying more. Keen food photographers will appreciate the photographs in this magazine. The photographer is the multi-award-winning Nando Esteva of Palma. As well as the recipes, I’ll be studying those pictures and trying to learn how to improve my own food photography (which, at present, is pretty basic). 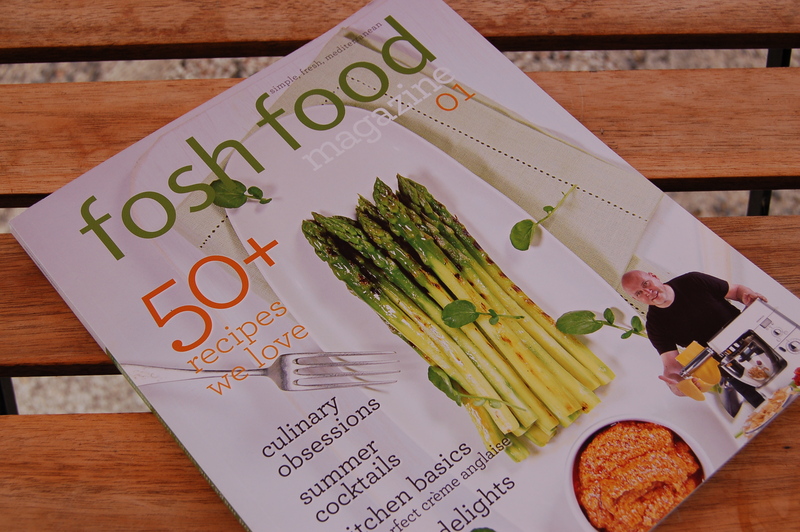 Fosh Food Magazine is available in separate English and German editions, priced at 9,50 euros. It’s available at bookshops, gourmet food shops, and Marc’s restaurants on Mallorca. In Germany, look for it in bookshops in major airports. I’m told it should soon also be available on amazon.es.